Like the TASER X26c Digital Battery, this quality product has an internal memory chip that records vital operational and status information, including remaining power available, performance, and number of deployments left for the battery pack. This is graphically displayed on the back of the TASER X26c, giving you confidence that the device is ready when critical situations arise. 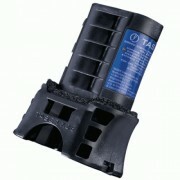 This TASER X26c Extended Battery w/Extra Cartridge Clip can be delivered in 3 to 5 business days. If you would like to receive your order sooner, guaranteed 3 day, 2 day and next day delivery options are available upon checkout. Orders placed by 2:00 PM central time ship the day they are placed. If you have any questions or concerns call our customer support staff at 800.960.2015 or click the live chat button on the right side of this page. Our courteous and professional customer support team is always glad to help!